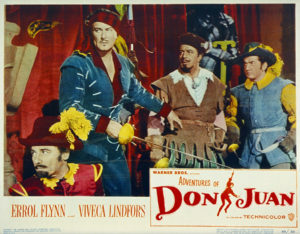 Errol Flynn had given up doing swashbucklers after The Sea Hawk (1940), but with the revival of the historical adventure genre in the late ‘40s, Warner Bros. gave him a sword and put him back in trunk-hose for The Adventures of Don Juan. But it must be said, Flynn doesn’t seem entirely comfortable in the rôle of Don Juan de Maraña, the scandal-plagued womanizing rogue who is forced to give up his naughty ways and turn over a new leaf. After disgracing himself picking forbidden fruit at the English Court, Don Juan is summoned back to Madrid by the Queen of Spain (Viveca Lindfors) and commanded to reform—which he does, improbably, because his soul is purified for the first time by his true love … for the queen. (No, really.) Purged of the rakish qualities that made the character distinctive, Don Juan becomes a conventional noble who gets entangled in conventional court intrigues, saving the queen from a conventional treasonous minister by foiling his conventional plot at the last minute—as usual. Flynn seems vaguely embarrassed by all this, while Swedish beauty Lindfors looks majestic, but seems to have just two emotional states, detached or petulant. Only Robert Douglas as the villainous Duke de Lorca seems to get his teeth into his part, oozing arrogance and cruelty, and going out in fine style in an epic duel with Don Juan on the palace’s grand staircase. Don Juan, of course, is the famous antihero of a long tradition of stories, operas, and epic poems, but strangely this movie draws on almost none of that rich background, with one curious exception: that final duel takes place at the foot of a colossal armored statue of The Commander, the figure of ultimate justice that appears at the end of so many tales of Don Juan. Why that, and nothing else? Who knows? At least there’s a fine surging score by Max Steiner, the Oscar-winning costumes are excellent, production values are high, and the fencing is better than usual. But go back and compare this merely-adequate film with John Barrymore’s stunning Don Juan (1926) and you’ll shake your head ruefully.